Turin is an old signora who wears silk scarves in spring, perfectly pressed linens in summer, and her 50s-era mink coat in autumn and winter. Her hair and makeup are perfectly done, and she lives in a splendid, high-ceilinged palazzo with chandeliers and art nouveau trimming. I say this to help explain Turin’s reaction to efforts at gentrification. When it comes time to revitalize run-down neighborhoods, Turin doesn’t eagerly embrace it like an adolescent; she doesn’t grab the chance by its horns to squeeze the most out of it like a savvy businesswoman. No, Turin looks askance at it because she would actually be perfectly content to go about her everyday business and not change a thing. But she accepts it, in the end (with pursed lips) because she is also very proud. Improvements to Turin happen and are successful, but changes are subtle, gradually working themselves into the fabric of everyone’s lives. 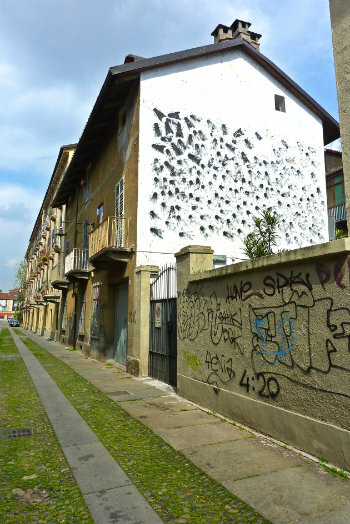 In the past two decades, several neighborhoods of Turin have done a 180°: the Quadrilatero, from a ghetto you didn’t want to set foot in at night to the place to be for aperitivo and higher-end restaurants (which can almost verge on touristy); San Salvario, from heroin-ridden to the town’s hotspot for quick eats and late nights (it tends to fall back into rough-and-tumble occasionally, so keep your eyes open and purse close); Parco Dora, from a post-industrial wasteland to an outdoor artistic and electronic music hub. None of these spots really “teem” with life and movement, unless you go to San Salvario on a weekend after 11 pm. Teeming is not something a proper signora does. But these neighborhoods have had new life breathed into them, and make for an all-around more beautiful, interesting, and livable Turin. Another one of these neighborhoods is the Campidoglio, located in northern Turin and bordered by Corso Tassoni, Corso Francia, Via Zumaglia, and Corso Regina Margherita. To its immediate east lies the Borgo San Donato (come here for a great craft beer at Birrificio La Piazza; and a good pizza with fun, live music Friday through Sunday—often cover bands—at La Divina Commedia). Campidoglio is essentially a snapshot of Turin in the 1800s: its narrow roads have grass growing between the cobblestones, the bustling sounds of the city and busy Corso Francia are entirely muffled, and the homes rarely rise above two stories. Originally, the Campidoglio area was built by Signor Doglio (hence its name) as the living quarters for farmers who moved to the city looking for work. It remained residential and artisan, with many small shops and craftsmen opening their businesses in the piazze; these were called “boite.” They remained until the 1970s, when they began to disappear and the neighborhood fell into ill repute. 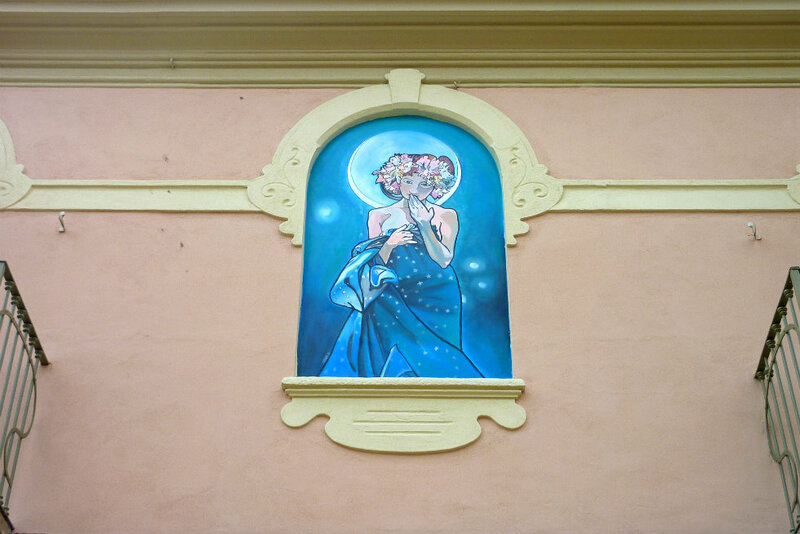 Things didn’t start looking up again for Campidoglio until 1995, when the MAU – Museum of Urban Art – was founded: an open-air museum of some 140 murals painted on the buildings. Then, in 2009, the FaciliTo project began financing small businesses in the neighborhood. Walking through Campidoglio today feels like the most peaceful neighborhood stroll you can find in Turin. The modest homes are colorful, and low enough to let sunlight down to the narrow streets; the roads have hints of green from the grass between the cobblestones, and the tree-lined streets and parks dot the area. And it’s tons of fun to find murals. As for the boite, the shops, and the attempts at redevelopment? Several caught my eye, such as the artists’ workshop Da Torino con Amore (From Turin with Love) on Via Rocciamelone, but they were closed on a Saturday (small business hours; plus, the Saturday before Easter). In other words, true to Turin la signora: successful, but subtly so. 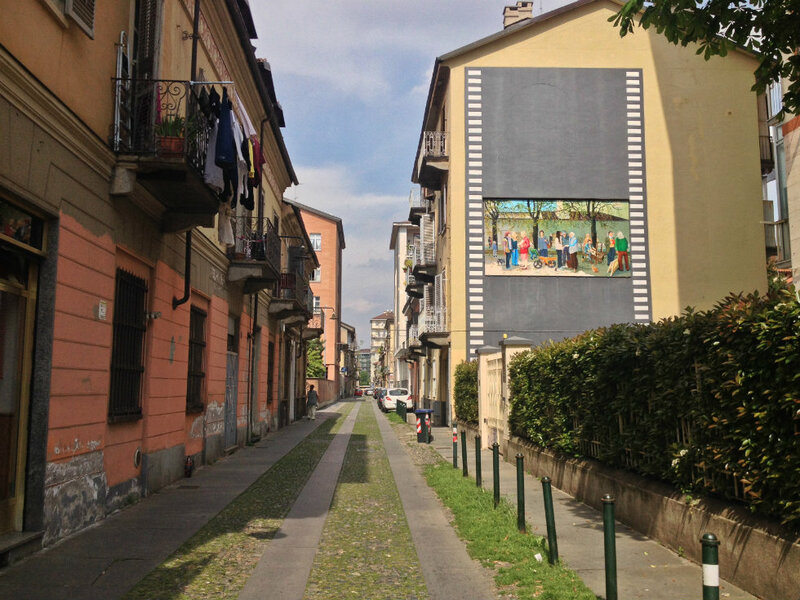 To get to the murals, stop off at the Racconigi metro stop and walk up the tree-lined Corso Svizzera until Via Fabrizi. Here, you should take a left for a gelato at Gelati d’Antan. They hang up postcards of that day’s artisan flavors by little clothespins. I got cioccolato cubano (70% dark chocolate with dark Cuban rum) and crema del Roero (mascarpone, amaretto, and Brachetto wine—next time, I’m getting an extra-large cone just with this flavor!). 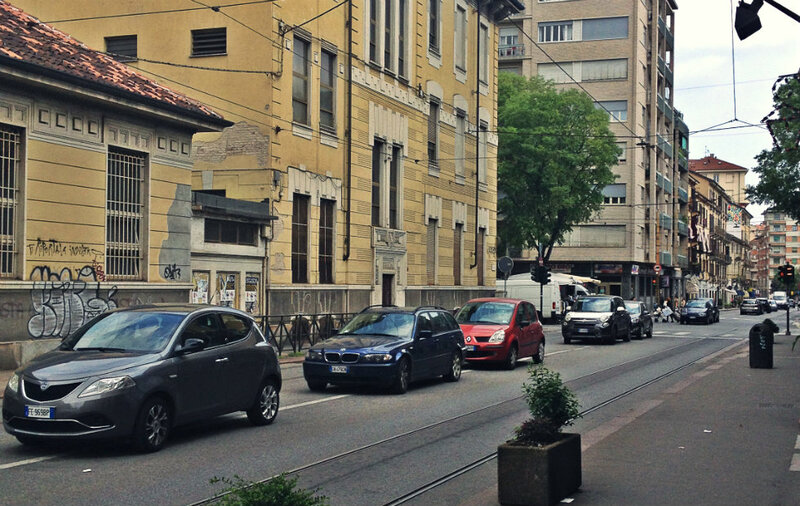 Enjoy your gelato, pondering how it must be legal to park your car in the exact middle of the street on Via Fabrizi, then walk down this street back the way you came, crossing Corso Svizzera. Now, to your left, you’ll start seeing roads with paved strips and cobblestones between them. This is the core of Campidoglio; walk up and down these streets to find the murals. Some streets where I found the most were Coria and Lucano. Basically, the area between Via Colleasca, Via San Rocchetto, and Via Locana have the most. Don’t forget to look up and behind you as you’re walking! Painted spots can even appear in unexpected corners. Campidoglio is also great for a summer evening out. Restaurants put out tables on the roads, there are several bars and spots with live music, and the whole atmosphere is very personal and feels like you’ve stepped into another town. 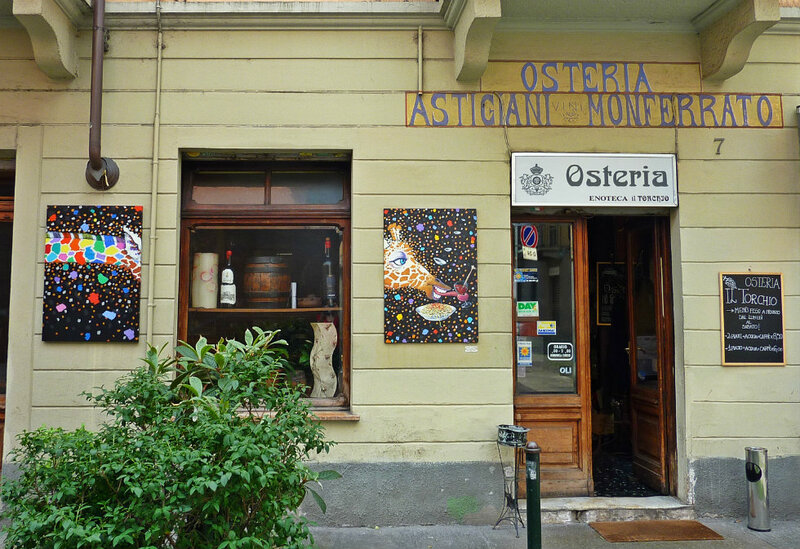 I had a very good dinner at the Osteria Il Torchio, and right down the same street (Via Rocciamelone) is Ristorante Campidoglio, which has good reviews. You might even find la signora Torino strolling these streets in the summer…she won’t likely deign to frequent a restaurant because the vibes of this neighborhood are a little too friendly and familiar and artisan for her tastes (plus, she has reservations at Il Cambio later). But she’ll approve of the improvements that have made this little angle of her city that much more welcoming and alive. Great article, Diana — I’ve filed it for my next time in Turin and shared it with followers of my page at facebook.com/worldbite. Great! Yes, it’s a cute little neighborhood worth exploring. Thanks for sharing.